VLCC is known for its spectacular range of facial kits and this diamond facial kit is for those who are tired of their dull and lifeless skin. The kit includes- scrub, detox lotion, massage gel and wash-off mask that would detoxify your skin, protect it from signs of aging and bring a youthful and glowy look back to your skin. The kit is power packed with ingredients like diamond bhasma, Vitamin E, olive oil extracts, aloe vera, jojoba oil, glycerin that is sure to enhance your skin texture. Get your hands on this facial kit and forget dull skin forever. This kit works excellent in brightening the skin, giving an instant glow to skin which lasts for about 2-3 days. If you are looking for a facial kit that would lighten your skin tone as well as soften your complexion, then you ought to try this facial kit from Lotus. This kit definitely tops our list of Top 11 Facial Kits. The kit offers massage cream, activator, exfoliating cleanser and mask that would work perfectly in removing dead skin cells, dark spots, wrinkles and fine lines. Once you use this facial kit you will notice your skin hydrated and softened – thanks to the pearl dust and licorice green tea extract which repairs your damaged skin. This diamond facial kit from Nature’s Essence is meant to prep your skin for the upcoming festivities. This facial would suit even the sensitive skin as it is packed with Vitamin E, diamond dust, walnut grains, wheat germ oil and other powerful ingredients that would brighten your skin in the best way. The kit includes facial cleanser, scrub, and polish cream that will purify your skin from impurities, slough dead skin cells and leave your skin with a lasting glow. This facial kit is perfect for the women who are super busy with their errands. The VLCC insta glow facial kit has 5 sachets of Indian Berberry face scrub, saffron massage gel, Snigdha face cream, instant glow face pack and skin vitality serum. This facial kit nourishes, lightens the skin and revitalizes your skin in the best possible way. Your skin not only looks gorgeous, but you can even feel the suppleness and softness which lasts for about 4-5 days. 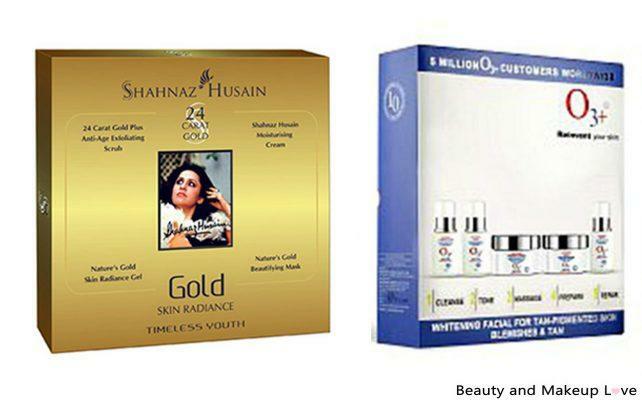 If you are a fan of Shahnaz Husain cosmetic products then this is a must-have in your vanity bag. The 24 carat gold facial kit is designed for dry, mature and dull skin, which are more prone to signs of aging. The kit contains 24 carat gold scrub, gold mask, gold gel and intense moisturizing cream with key ingredients such as rose water, aloe vera, honey, orange peel extracts, gold leaf. These ingredients work together to banish the signs of aging and promotes skin revitalization. 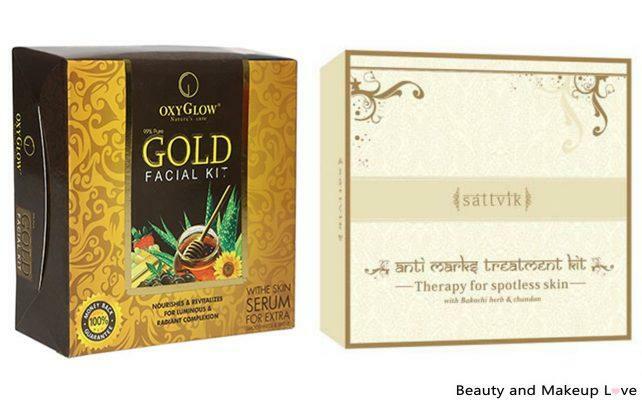 Get a super soft, radiant and youthful skin with this impressive gold facial kit. Wondering how to brighten your skin as well as reduce the blemishes? Then end your worries with this luxurious O3+ whitening facial kit that aims in whitening the complexion and fading the skin pigmentation. It is effective on normal to dry skin and is infused with Vitamin C and other ingredients that will bring a radiance to your skin, tighten your pores and reduce spots, acne scars, marks and other pigmentation. It consists of whitening cleansing foam, tonic, serum, whitening cream, and mask, use them once a week and notice a fabulous change in your skin. People would ask you the secret for the glow and youthful skin. It sure is expensive but worth an investment since this one kit lasts for about 11-12 uses! Wondering how to lighten the tanned skin and pigmentation for the celebration? Then we suggest you try the refreshing Sattvik anti marks treatment kit. The key ingredient of this kit is the papaya that lightens the blemishes and protects your skin from damage, acne, breakouts. Also, the papaya enzymes enhance collagen production and restore the elasticity of the skin. The kit consists milk cleansing cream, exfoliating scrub powder, anti blemish massage cream and depigmentation mask. Within weeks you can notice a good change in your skin- firm skin, tightened pores, reduced pigmentation, and dewy skin tone. As the ingredients are herbal it would suit combination, sensitive skin. Sensitive skin ladies welcome, youthful, radiance skin with a confidence with Oxyglow gold facial kit. This kit has the goodness of gold that protects your skin from wrinkles, fine lines and other signs of aging as well as brings a glow worth drooling. The kit includes 5 steps- cleanser cream, gold scrub, moisturiser, massage gel, gold face pack. As the moisture makes the skin greasy, this product is recommended for dry skin lovelies. Also within weeks you can see your skin turning super soft and glowy. Pamper your skin with the goodness of Biotique Party glow kit which has papaya scrub, saffron massage gel, clove face pack and saffron youth dew cream. Each ingredient is the holy grail for your skin and if you have oily skin, combination skin, then do get a shot to this glow kit. Remove the dead skin cells with papaya scrub, brighten it with saffron+mulberry extract massage gel, protect your skin from acne, excess sebum with the clove face pack and get a super glowing skin with turmeric, kesar, almond-infused dew cream. You would be pleased with effective results of the facial kit that comes at a super affordable price. The name ‘Party Glow’ sure gives a party kind glow to your skin with just one use! 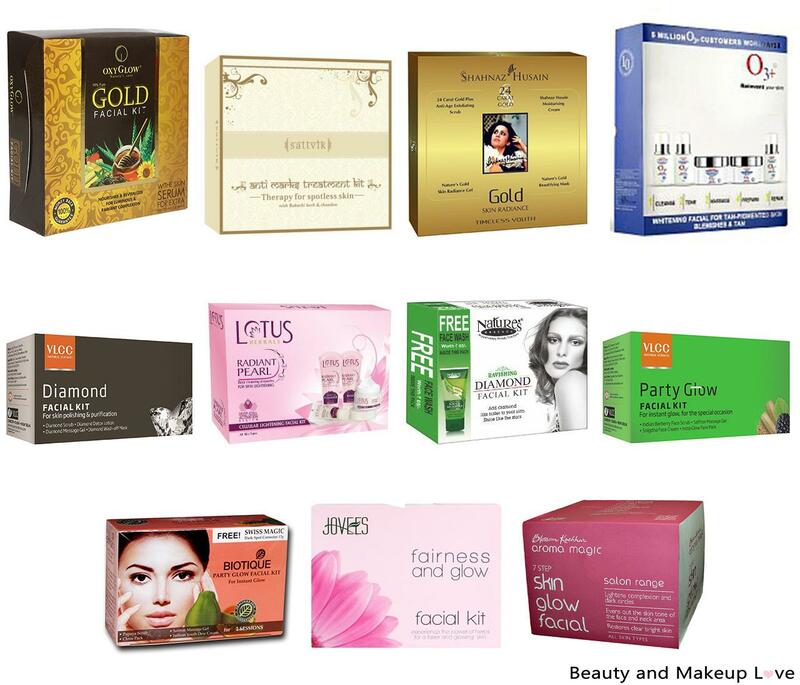 If you have a penchant for herbal products then Jovees fairness and glow facial kit is your bestie. The cleanser, scrub, massage cream, clay pack and fairness cream are supercharged with lemon extract, almond oil, coconut oil, rosemary oil, wheatgerm, avocado, Vitamin E, Multani mitti, saffron extract and other organic ingredient which will cleanse your skin in depth, remove dead skin cells, protect your skin from UVA/UVB rays and signs of aging. Along with a luminous skin, you will get clear, improved skin texture and would suit all skin type. Who said bridal kits are just for the brides? Even you can enjoy the luxury of radiating skin with the Aroma magic bridal glow facial kit. The 7 step salon style facial includes face cleanser, exfol gel, skin serum, nourishing cream, face pack, hydrating gel and sunscreen with ingredients that would suit every skin types. The facial kit protects your skin from sun damage, pollution, acne, excess oil and would boost healthy glow just like a dazzling bride. It works excellent in brightening the skin, giving a radiant glow which makes it perfect for the festive season besides being equally good for the bride to be! We hope this post helps you to pick the right facial kit for your skin type. This celebration season, welcome happiness with gorgeous skin worth appreciating. Let us know in the comments below which of these are your favorite facial kit. Thanks a lot for this post and I was new for facials. Kindly help me after using facial how long should I not use soap or face wash for face. Previous Previous post: Best Lip Balms for Dry, Chapped Lips in India!